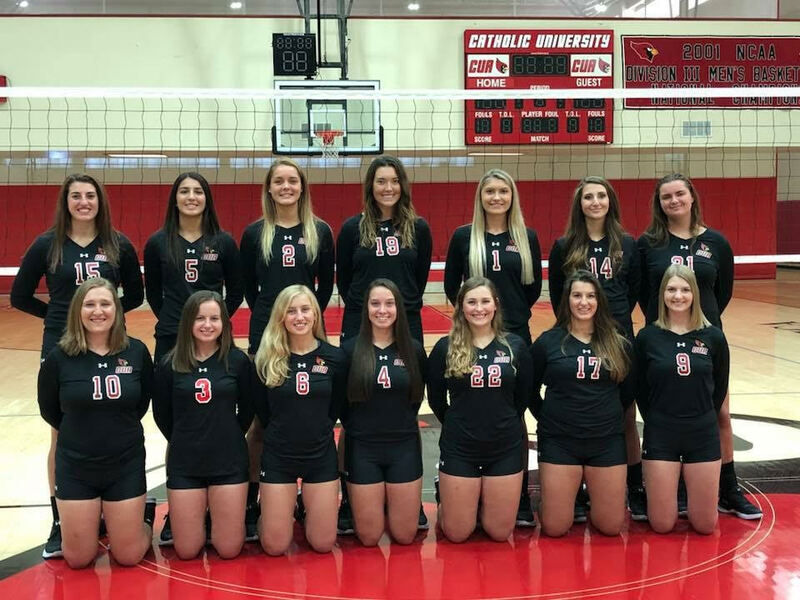 The Catholic University Women’s Volleyball team ended their season with a 19-13 record, and 4-2 in their conference. The Cardinals finished 3rd in the conference, which is an improvement over their predicted 6th place preseason ranking. The team boasted an impressive 11.21 kills and 17.74 digs per set, having an overall hitting percentage of .156%. “I think the girls on the team played really well together this season, and we really proved ourselves throughout the season. I was a little nervous in the beginning, losing seven seniors (five of them starters), and knew that we’d have to step up our game to be successful” junior middle Isabelle Cooper said. The Women’s Volleyball team overcame the adversity of the majority of their starters leaving to give their fan base a winning record to boast about. “I think the toughest game and the best victory for the team was our second match against Salisbury. We had already lost to them once but we knew we could beat them. So being able to come together as a team and fight back to get that win was very satisfying” junior defensive specialist Nina Kasputis said. The women’s conference wins include a 3-0 win against Moravian, a 3-1 win against Elizabethtown, a 3-0 win against Goucher, and a 3-2 win against Scranton. The Cardinals plan to get back to training as soon as possible, and plan to place even higher the following season, with sophomore Patricia Martinez and freshman Caroline Kelly, who were named All-Landmark Conference First Team and Second Team respectively, heading the team. Martinez had 444 kills for the season, averaging 3.79 per set, leading the league in both stats. Kelly had 603 digs, which was the second highest in the league, and averaged 5.11 per set.